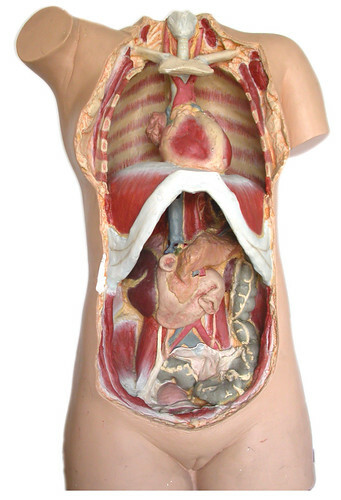 Visceral manipulation is the practice of an experienced therapist using his or her hands to move and release fascial restrictions in your abdomen and pelvis to encourage the normal movement and function of your internal organs. Most people are familiar with the idea of joint and muscle restrictions causing tightness, pain and limited movement in their bodies, but don’t consider the role of their organs. It is common place for people to go to their physio, chiro, or massage therapist to treat pain and alignment issues; unfortunately, many times these practitioners may just be treating the outer shell of the problem if they aren’t considering the mobility of your organs in your alignment and movement patterns. I have been a physiotherapist for ten years and have continued to add layers of knowledge and skills to my tool belt. Two of those skills have been real eye openers and game changers for me. The first big one was the profound effectiveness of skilled dry needling called IMS acupuncture. I trained with Dr Chan Gunn in 2008 and the skills I learned completely changed my practice for the better. I recently took a course on Visceral Manipulation through the Barral Institute and feel like I can now properly treat the body as a whole. I had previously learned how every joint in the body works, where all the muscles attach and which nerves innervate them, but had failed to properly learn how the inside of the body effects the outside. Visceral Manipulation is helping me properly understand just how connected everything really is.